Let me just preface by saying that I LOVE Sharon Lovejoy. She is a wonderful children's garden author, so before I even picked up this book I knew I wanted to own it and have it on my shelf forever. Sunflower Houses is filled full with the lore that made the ideas of Sharon's gardens come to life. (This book goes along with "Roots, Shoots, Buckets, and Boots". Roots and shoots is the book that talks about the how-to's of many of her most popular gardens.) She has interviews and stories from her many years of gardening experience and some just make you tear up reading them and the memories they hold for the people being interviewed. 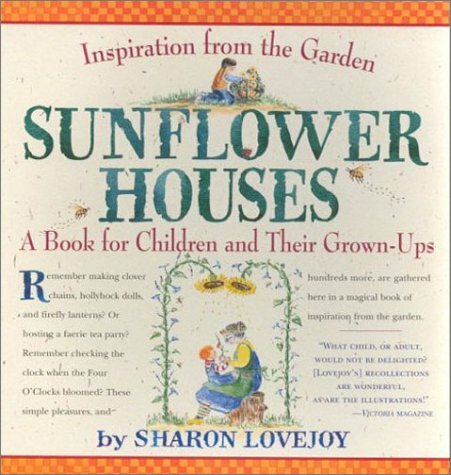 The story of the sunflower house in particular, where this woman fondly remembers the day they planted the sunflowers every year for their summer playhouse and reminisces with Sharon about what joy that brought her as a child, and how she will treasure it always. The drawings are amazing and done with vivid color, and the book is chalk full of wonderful stories, memories and best of all, ideas on how to make the most memorable gardens with your children. I have learned a lot from Sharon over the years. Many of her ideas are the ones that turned my garden from a place of refuge for me, to a place of honor and refuge for my entire family.